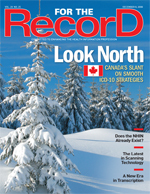 For The Record helps your business grow by offering you the opportunity to purchase reprints of articles or departments found in the magazine, or link to the article from your Web site. Share them with clients, colleagues, patients, and students. They're also great for your sales force and tradeshow handouts! Simply select an article below and e-mail us or call 877-652-5295 for more details. By combining the latest technology with the expertise of cancer registrars, healthcare organizations can gather rich cancer data to boost research efforts and improve care. 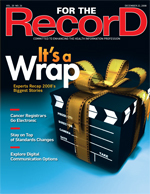 HIM industry experts lend their thoughts on 2008’s most newsworthy developments in HIT, coding, and transcription. For the coming year, The Joint Commission has revised the Standards Improvement Initiative in an effort to clarify language and make it easier to navigate. Virtual Colonoscopy — On Its Way to Being a Real Screening Tool? Doctors lament that too many people forego colonoscopy screenings, even though the early detection of colon cancer can save lives. Now that CT colonoscopy technology is maturing, will more people get screened? The proliferation of social networking sites and their offshoots has changed the way physicians approach patient care. A new study from the Center for Information Technology Leadership found that providing interoperable personal health records to 80% of the U.S. population could save billions of dollars. In a new methods-based planning book, two CIOs offer tactics, tools, and templates for building an IT plan. Researchers are touting the benefits of making health information available online for teenagers. Get the lowdown on healthcare’s facts and figures. As electronic medical records become more prevalent and more clinicians consider inputting their own documentation, the role of medical transcriptionists is beginning to transform. Does the NHIN Already Exist? A HIMSS white paper suggests that the healthcare industry may be pulling its hair out for no good reason as it tries to find the most convenient method for creating a nationwide network to exchange clinical data. Although the situations are not exactly the same, the United States can still gain valuable insight by taking a look at Canada’s approach to this massive undertaking. People affected by this disorder undergo tremendous body changes in a brief period of time and must wait patiently while a battery of tests is performed to confirm a diagnosis. Two facilities have adopted scanning technology to help in their quest to successfully enter the digital age. The Centers for Medicare & Medicaid Services has issued a final rule establishing a program aimed at boosting physicians’ use of e-prescribing technology. Technology continues to reshape the industry, with the latest examples being interactive tools for iPhones and iPods and genome services. A survey measuring consumer use of hospital Web sites reveals several interesting tidbits that lend insight into what types of information are the most sought after. Wouldn’t it be wonderful for physicians’ offices if they could submit a claim at the time of service, receive a fully adjudicated claim response from the payer, and collect the appropriate payment before the patient leaves the office? Instead of bemoaning their situations, several rural healthcare organizations have become leaders when it comes to HIT adoption. The date has been set (for the time being), but will anxious organizations be able to react in time, or will they count on a delay to help them better prepare? Most healthcare professionals already know how dangerous falls can be for older adults. What they may not realize is how preventable most are. 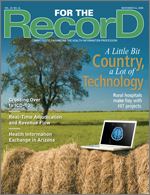 Rural hospitals face numerous challenges as they try to keep up with their urban brethren in terms of technology. A RAND study found that unique patient IDs would make it easier to protect patient privacy and would save more money than it costs through increased efficiency and reduced errors. New emergency department kiosks alert clinicians about high-risk patients following check-in. About 6 million Aetna members who have personal health records through the health insurer are now able to transfer their medical information to Microsoft’s HealthVault online platform. This odyssey can lead practices in every direction, but industry experts and experienced physicians are here to lend a guiding hand. With the AHIMA, MTIA, and the AHDI supplying the industry with the necessary metrics, now is an opportune time to explore methods to increase efficiency. 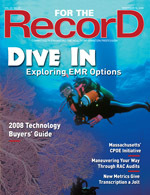 Spurred by a disheartening report about medication errors, the state has announced that all hospitals must have computerized physician order entry systems installed by 2012. 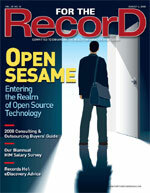 Get the scoop on the vendors that are paving the path toward an integrated healthcare system. Experts recognize that using the mind keeps the aging brain more agile, possibly delaying the onset of dementia. But opinions differ on the most effective methods of achieving brain fitness in older adults. 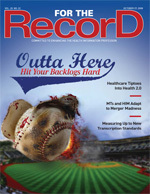 Healthcare organizations are urged to go on the offensive when it comes to dealing with RAC audits. A new study by the actuarial firm Milliman projects that Medicare and private health plans could cut overall medical costs by more than 1% by using online healthcare services. Backed by funding from the AHIMA and FORE, Care Communications has launched a new study examining the evolving role of HIM leaders. How Well Do You Measure Up? In part one of a two-part series, learn about the transcription industry’s ongoing efforts to establish a clear, concise method of measurement. HIM departments can experience a shortage of coders for any number of reasons, making it important to have a plan in place that will keep charts flowing. Demonstrating that it is willing to keep up with the times, the healthcare industry is beginning to tread lightly into social media that connects patients and providers in an information playground. A recent paper assesses the economic cost of new oncologic interventions and how it needs to be factored into the treatment equation. The latest HIT report from the Government Accountability Office cites the movement for failing to fully address previous privacy issues. The spate of mergers taking place in the transcription industry raises questions about their effects, including how MTs and HIM staff will adapt. Seattle and Tennessee are the latest areas to develop online tools that allow consumers access to medical service comparison tools. Florida doctors can now receive e-prescribing services at no cost. New tools that analyze patient medical records to assess insurance eligibility have privacy advocates concerned about the implications. 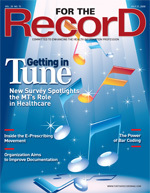 A quality incentive project featuring healthcare transparency and pay-for-performance concepts has drawn rave reviews. Whether it’s a good-looking guy across the bar or a finicky payer, no one likes being rejected. Fix the latter by developing a sound system. The Universal Newborn Hearing Screenings program has had a profound effect on the medical community’s ability to detect potential problems. Get smart and peruse this handy guide to the institutions that can help put you at the head of the class. Like taking care of colicky triplets, figuring out the nuances of how to code for respiratory distress syndrome in a newborn can pose quite a challenge. In a new survey, HIM directors comment on the effects of the Recovery Audit Contractor program. U.S. Pharmacopeia has debuted a Web site that lets patients and doctors identify whether they have received or prescribed medications with names that appear or sound the same as other treatments. Virtual Visits — The Way of the Future? According to a new study, patients who received treatment over the Internet had a better chance of obtaining safer care than those who opted for office visits. Electronic technology has helped healthcare professionals in two communities offer the underprivileged a better standard of medical care. Without concise physician documentation, healthcare organizations face the risk of sinking reimbursement and poor care. Hepatocellular carcinoma is frequently fatal within one year, but a new microsphere treatment may improve outcomes. Achieving interoperability can be made easier by using standardized clinical language. Visit a Michigan health system that instituted a five-step plan as it prepared to install a document capture system. Colorado is set to launch what may be the nation’s largest health information network. Three Washington state communities will receive grants to test consumer-managed health record banks. The Agency for Healthcare Research and Quality has released software to help hospitals assess their response to disaster drills. A New England Journal of Medicine study chronicles the slow pace at which physicians are entering the digital world. 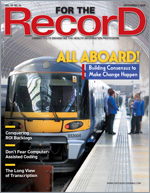 What can be done to improve electronic health record adoption rates? allowing them to reap the full benefits. The general public is demanding better safeguards for its medical records. What’s that mean for healthcare organizations? Diagnosing multiple sclerosis is no easy task, a circumstance that makes finding new, more effective treatments even more important. Data interoperability between acute and ambulatory facilities can lower costs, increase patient safety, and improve care. In a pilot program, Medicare beneficiaries in Utah and Arizona will be able to access personal health records populated with claims data. 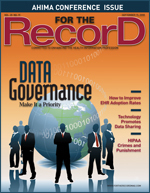 A new online request system streamlines external medical record collection. A new Web site suggests it’s time to put aside those cumbersome coding manuals and rely on its reservoirs of resources to find the codes that match your situation. Developing an effective change management strategy can help skeptical staff feel more comfortable about adopting and using new technology. Step inside Illinois’ Memorial Medical Center, an acute care hospital faced with the task of accelerating turnaround times for government disability claims. Experts say coders should embrace, not fear, computer-assisted coding technology. South Korean researchers have released a study that demonstrates how sonography can effectively distinguish between malignant and benign thyroid nodules. As bad news keeps pouring in on the healthcare system’s poor economic state, it’s time to take stock on where medical transcription fits in the scheme of things. The Certification Commission for Healthcare Information Technology has accepted recommendations for personal health record certification. The South Carolina Health Information Exchange will allow state healthcare providers to electronically access Medicaid beneficiaries’ medical histories, including past prescriptions and treatment. A software-based system automatically checks self-pay registrations against Medicaid to identify potential coverage. Industry experts discuss ways to wake up consumers to the idea of establishing a personal health record. By automating the revenue cycle, healthcare organizations can quantify charity care while curtailing the incidence of bad debt. As more healthcare organizations move toward electronic record-keeping systems, will the transcription industry find its services to be less in demand? This rare, progressive disease leads to hardening and tightening of the skin and connective tissues—in some cases, it also affects blood vessels and internal organs. The World Series, hayrides, and new ICD-9-CM codes. What says fall more than this trio? A Wisconsin insurer’s Web site will list the estimated costs for 39 tests and procedures, including mammography, colonoscopy, and knee replacement surgery. The initial members of a telehealth project in California’s San Joaquin Valley will use real-time video consultations with medical specialists in fields such as dermatology, psychiatry, pediatrics, endocrinology, and gastroenterology. Physician practices looking to boost office efficiency have two more options available to fill their needs. As the amount of discoverable electronic data grows seemingly on a daily basis, it’s imperative for healthcare organizations to be prepared to meet requests for such information. Billed as a low-cost option for larger healthcare organizations, the concept is gaining stature in the industry though it still has drawbacks. The numbers have been tallied, and the results have been formulated. Now it’s time to see what HIM professionals are earning. Chock-full of forward-thinking organizations, this listing serves as a guide for those seeking help from outside their hospital doors. Baby boomers are fast approaching the big 6-0, making pain management more of a focus for healthcare providers. An Oregon informatics expert says as many as 40,000 IT professionals may be needed if the healthcare industry is to fulfill its technology adoption goals. 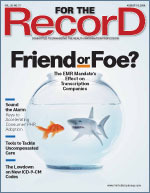 Guidelines have been created to address concerns that personal health record companies are not subject to HIPAA medical privacy rules. 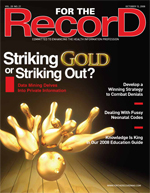 Get up-to-date on the latest wheelings and dealings in the health information industry. A new partnership between JCR and MC Strategies creates more opportunities for healthcare professionals to fulfill their continuing education requirements. A CIGNA pilot program will offer virtual seminars, interactive displays, and educational games to encourage preventive care and healthcare behavior changes. Whether it be at the physician’s office, in the emergency department, or through a regional network, e-prescribing is helping to curtail the shortcomings of a paper-based system. Gary David, PhD, lead author of a Bentley College survey that examines the state of the medical transcription community, shares his thoughts on the study’s enlightening initial findings. Low adoption rates or not, bar-coding technology continues to receive rave reviews for its ability to alert healthcare professionals to medication errors before they occur. Do foods containing prebiotics and probiotics improve gut health, or are manufacturers cooking up false hope? Learn more about the Association of Clinical Documentation Improvement Specialists, a rookie organization with designs on getting physicians to enter complete medical records. The Association of Academic Health Centers has released a report detailing how several disruptive aspects of the HIPAA privacy rule are putting a crimp in biomedical research. A new Intel Web site features interactive forums, personal profiles, message boards, and links to the latest research and treatment information. MRO now offers end-to-end electronic transactions for disability release of information requests. With its ability to build reports and organize data, ILP has the potential to reshape documentation practices. Accounts have been circulating that HHS is in the process of conducting unannounced HIPAA security audits. Industry experts weigh in on what’s really happening. To get a stranglehold on wildly fluctuating income swings, some healthcare organizations are turning to advanced software solutions. New research has added four additional factors for practitioners to consider when devising an outlook for these babies. Public health reporting in Massachusetts has received a boost from an electronic system that identifies contagious diseases more effectively. The Office of the National Coordinator for Health Information Technology released a five-year strategic plan that aims to coordinate and advance the federal government’s HIT efforts. California Attorney General Jerry Brown has announced a plan to make the state’s prescription drug tracking database accessible online. Grundig Business Systems has added an adjustment screw to its dictation microphone. To put themselves ahead of the curve, healthcare organizations should be aggregrating data and using analytics to better turn their operations. A special project plans to give providers the opportunity to receive interoperable reports that conform to standards for information exchange. Agreeing on a fair and equitable contract can lead to a solid long-term relationship between hospitals and coding vendors. MRI and PET each offer distinct imaging advantages. Now, scientists at the University of California, Davis have developed a hybrid scanner to maximize those advantages. Facilities that have a patient population paid by diagnosis-related groups need to be on the lookout for incorrect payments. Eleven hospitals in the Oklahoma City area have joined an electronic health record network to let emergency department physicians share patient information. Illinois has introduced a secure Web portal that allows physicians treating Medicaid patients to view past prescriptions, immunizations, and procedures. Complete this year’s questionnaire and you could win a valuable prize. Just about everything these days is going virtual, so why should transcription tools be left behind? Check out the latest device for digital dictation. Having top-flight security safeguards is of little use to healthcare organizations if the proper policies aren’t in place to eliminate illegal human behavior. With government agencies scrutinizing the reimbursement process like never before, revenue integrity departments are becoming more in vogue with HIM directors. Wouldn’t it be nice if you could store your personal health information in a safe depository that could be easily accessed around the clock by yourself and authorized healthcare professionals? The Health Record Banking Alliance has a plan to make that a reality. Learn about the obstacles patients with TBI and their families face and how a team of healthcare professionals helps them along the road to recovery. Intelligent software agents are making it easier for healthcare organizations to exchange data. Kaiser Permanente’s $4 billion electronic health record system will let 13,000 physicians in nine states and Washington, D.C., access patients’ outpatient records. Learn who the American Academy of Professional Coders named its coder and networker of the year. The social media movement commonly known as Health 2.0 is having far-reaching effects as various principles become more familiar with its tools. No longer confined to the medical records department, HIM professionals are free to explore the opportunities presenting themselves through new technologies and initiatives. Since federal rules and regulations seem to change every month, this listing will come in handy when healthcare organizations search for help. Radiofrequency identification can help healthcare facilities boost productivity, but privacy advocates say it may come at a cost. The State Alliance for e-Health recently recommended a strategy for how states can promote the growth of health information exchange. Loading up on a fair share of potatoes and bananas may do wonders for keeping the old ticker up to speed. Is the hospital industry headed for an economic crisis? A Duke professor believes it is—unless immediate action is taken. A survey of U.S. healthcare organizations suggests that the industry’s focus on medical privacy and HIPAA compliance limits other patient data security practices. Two national studies spotlight the barriers faced by healthcare facilities that are considering implementing point-of-care computing solutions. A joint task force on standards development has provided recommendations for transcription turnaround times. According to experts, facilities that adopt health information systems without first performing a detailed workflow analysis are asking for trouble. Because it doesn’t use radiation, MRI is generally considered a lower risk modality than CT. But concerns about nephrogenic systemic fibrosis and the need for faster turnaround times are driving manufacturers to develop more non–contrast-enhanced MRI exams. This all-encompassing listing spotlights the vendors and other companies that are leading the charge toward electronic patient information. An MTSO owner analyzes what effect the visible black character standard of measure is having on the transcription industry. More than one quarter of governors who delivered state of the state speeches this year have touted the benefits of HIT, analysts from research company INPUT found. Building on its remote stroke evaluation service, a telemedicine company has added a new general module to its platform. Get the latest on healthcare’s comings and goings, as well as merger news. The federal government has posted the results of the first-ever CMS nationwide hospital quality survey on its Hospital Compare Web site. Healthcare experts say don’t settle for automating just the basic functions of an emergency department. By taking the time and care to perform thorough audits, healthcare facilities can get a better read on where their organization stands when it comes to reimbursement. The Wisconsin Health Information Exchange introduced a data-sharing project last month that it hopes will expand to include more diverse sources. Reducing the time between diagnosis and treatment generally results in better patient care, and new ultrasound techniques may help clinicians shorten that gap—possibly even allowing biopsies to be performed at the time of a suspicious finding. The Centers for Medicare & Medicaid Services’ Recovery Audit Contractor program will have lasting effects on providers and coders. Attendees at this year’s Medical Transcription Industry Association Conference received a wake-up call. Members of the International Association of Dental and Medical Disciplines will receive reimbursements from Aetna and CIGNA for online patient visits. Brigham and Women’s Hospital and Yale University School of Medicine are to receive $2.5 million over two years as part of an AHRQ clinical decision support grant. A transcription warning index measures performance by analyzing physician satisfaction, cost, quality, and turnaround time. Facilities serious about quality documentation should take steps to get dictators up to speed on the importance of using best practices. Merging electronic medical record technology into the world of cancer registrars has the potential to transform how data are collected and analyzed. Quill Power — Is the Digital Pen Mightier? Convincing physicians to put down their traditional writing utensil for a fancy new gadget can be difficult, but the results could be well worth it. A recent study has prompted the FDA to approve the use of self-expanding stents in the treatment of peripheral arterial disease. The National Alliance for Health Information Technology is about to issue its final report on the standard definitions of five key HIT terms. It is often necessary to gain an outside perspective to get a fair measure of how your revenue cycle is performing. Learn about the latest wheelings and dealings. The Center for Democracy & Technology has joined forces with the Health Privacy Project to develop policies aimed at protecting the privacy of electronic health information. Aetna’s new online search service connects members to medical information. A new service provides real-time access to clinical results and images. Discover some of the key figures shaping the healthcare industry. More facilities are implementing concurrent coding programs in an effort to address the need for more specific diagnoses and to meet quality-based initiatives. In a variety of situations, this sometimes-overlooked technology is making it easier for patients in remote settings to receive the care they need. Getting rid of retired medical records may seem simple enough, but stringent privacy rules sometimes make it tricky. That’s where outsourcing can help. Findings from a recent study indicate that treatment for inflammatory breast cancer needs to be different from other types of the disease. A rural Wisconsin healthcare organization realized integration and workflow benefits when it installed an electronic document management system. The Association of Health Information Outsourcing Services is taking issue with the reimbursement provisions in two Illinois laws requiring state health facilities to electronically provide information from electronic health records when requested. Despite having somewhat different goals, it’s important for HIM departments to develop a solid working relationship with radiology. A present-on-admission module has been added to a computer-assisted coding solution to help hospitals comply with new federal regulations. Oregon’s largest medical liability carrier has announced discounted insurance premiums for physician practices that connect electronically with patients. If controlled substances became eligible for e-prescribing, many industry experts believe that the technology would enjoy more widespread adoption. A pair of pilot personal health record projects will measure the adoption rates of Medicare and Medicaid patients and serve as a testing ground for their financial sustainability. 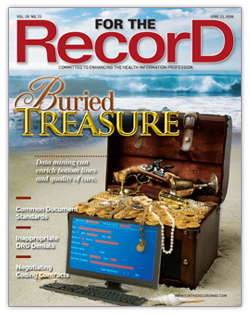 An Oregon radiology practice is reshaping its operations by implementing an electronic document management system. Recent studies indicate that childhood behavior, including eating habits and exercise patterns, influences the chances of developing cardiovascular disease as an adult. The recent HIMSS conference featured record-breaking crowds and several noteworthy speakers. A medical transcription service owner examines the reasons why some people believe sending work overseas is not necessarily coming at the expense of American jobs. Researchers at two University of Texas institutions have released the results of a study measuring the accuracy of online breast cancer information. A nonprofit organization has devised a program that offers physicians the opportunity to earn up to $100,000 in yearly incentives. 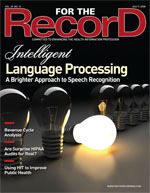 The addition of digital signature and annotation features boosts the effectiveness of an electronic fax record service. Overseas Transcription — Is India Still the Low-Cost Option? Recent changes in U.S. and Indian economics have somewhat altered the landscape for organizations that depend on an offshore workforce. Currently, the Recovery Audit Contractor program is being piloted in three states, with plans to have it up and running nationwide by 2010. Based on the results so far, what can health-care organizations expect to see when it arrives for good? Data are the lifeline of any healthcare organization, but what happens when that pulse is in jeopardy? Then it’s time to put your disaster recovery plan to the test. There are a number of strategies available for patients who struggle to gain weight due to psychological and physiological causes. Developing strong working relationships with other departments can bolster productivity not only in the coding department but throughout the hospital as well. The Blue Cross and Blue Shield Association’s five-pronged attack to improve healthcare relies heavily on wider use of HIT. Insiders say a new Minnesota Web site designed to serve as an online medical marketplace could significantly affect how U.S. residents purchase healthcare. In the continuing quest to reduce the number of medication errors, an HIT company has introduced software that eliminates drug name confusion. The Voluntary Universal Healthcare Identifier Project is being introduced at this year’s HIMSS conference to boost efforts toward a national system. According to proponents, service-oriented architecture can enable integration of previously inflexible information systems. Communication A Wisconsin managed care network serves as a model for how plans can use the Internet to streamline and automate work and come away with a quantifiable return on investment. Tablet PCs can be a boon to facilities in their quest to mobilize their healthcare data, but it takes a solid infrastructure to make it all work. An Italian physician has led the charge to attack the ailment through a regimen that includes the use of high-resolution ultrasound guidance. A clearer, more unified vision of personal and electronic health record adoption is needed if the technology is to make its mark. The coding for physician phone calls to patients has recently been revamped. In addition, there is a new code for electronic communications. Members of some WellPoint consumer-driven health plans in California, Connecticut, and Ohio now have access to a new online physician rating tool created by the insurer and Zagat Survey. Market research firm INPUT predicts that the HIT market will expand at a rate of 8.6% annually, topping out at $10.8 billion in 2012. A new safety syringe avoids exposing the needle to the healthcare professional during the entire injection process. By automating the release of information, healthcare organizations can turn a cumbersome process into a moneymaker. Despite what seemed to be gloomy news from a recent Harvard University study, several industry experts believe regional health information organizations still have a fighting chance. Time is a precious commodity in the emergency department, making it an ideal setting to test speech recognition’s prowess for precise and speedy documentation. Clinicians in various specialties are discovering what their colleagues in obstetrics already know—3-D ultrasound has many benefits. It takes a master craftsman to construct a solid DRG that can stand on its own. An Arkansas medical facility has adopted an intranet portal that allows it to monitor Joint Commission policies and procedures. A survey about health information exchange reveals advances in some markets and a pressing need for more action on a national scale. A clinical software provider has announced upgrades to its emergency department information system. Once facilities go electronic, they often are left with 10 to 30 years of older medical records that must be kept in paper format. What storage strategies work best? Pediatricians puzzled by what to shop for when choosing an EMR now have a set of guidelines to help with their decision. Hospitals are faced with getting a handle on quickly and efficiently dealing with patient requests for cost estimates. People who suffer from food allergies have plenty of choices available to help them determine if they actually do have an adverse reaction to certain foods. Pick and choose the vendor that can turn your transcription concerns into an afterthought. A Georgia hospital adopted an emergency department information system to help eliminate the stress of unannounced surveys. Florida State University researchers have gathered evidence to support the claim that IT systems lead to better health outcomes. A Web site created by a Blue Cross and Blue Shield of Minnesota affiliate lets consumers share feedback on medical services and providers. The iPhone’s versatility reaches into the health sector with the news that it now provides physicians with access to e-prescribing. Get the inside scoop on the trends likely to garner headlines this year. Who owns and controls the information inside personal health records? At times, the line can become blurry. Major construction signs are being erected around the state’s healthcare system, aiming to make clinical data available to all providers. Healthcare insiders are skeptical that the federal rule allowing hospitals to help cover the cost of electronic medical records will have a significant impact on adoption rates. Widespread adoption of this cancer-fighting technology has been limited by costs and space, but now there are plans to address those concerns. The process of querying a physician is a delicate one that must be handled according to strict guidelines. The eHealth Initiative Foundation has launched a project with three healthcare companies and two community-based health groups to accelerate the timeliness and effectiveness of drug safety efforts. A secure messaging solution helps healthcare organizations reduce costs, improve worker productivity, and enhance patient relations. A three-year, $400 million pilot program announced by the Federal Communications Commission will help extend broadband communication lines to 6,000 rural healthcare facilities.